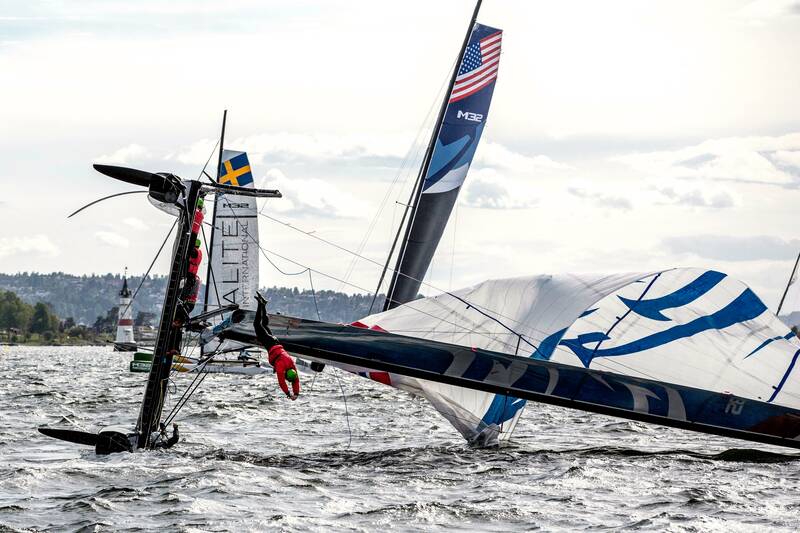 With five different boats winning the first five races of the M32 Series opener in Oslo, calling the racing ‘tight’ is something of an understatement. The one boat off the pace is first-time M32 competitor Eivind Melleby’s Team Hydra from Norway, and here’s a shot showing their form on a puffy day in the Oslo Fjord. The M32 proved its beach cat heritage accurate – Melleby’s team was upright and racing 15 minutes after their tip. Thursday’s highlight reel is here, and the full replay of the live footage is here. Stay tuned to the front page for today’s racing, beginning at 1400 CET/0800 EST with Clean on the mike. Photo credit Henrik Ljungqvist/M32Series.